Very bright and fully furnished apartment for rent at the charming Fultonstraat. Central location just 10 minutes by bike to the center. Near the Laan van Meerdervoort, Weimarstraat, restaurants and shops. Good connection by public transport. Open stairs to the first floor. 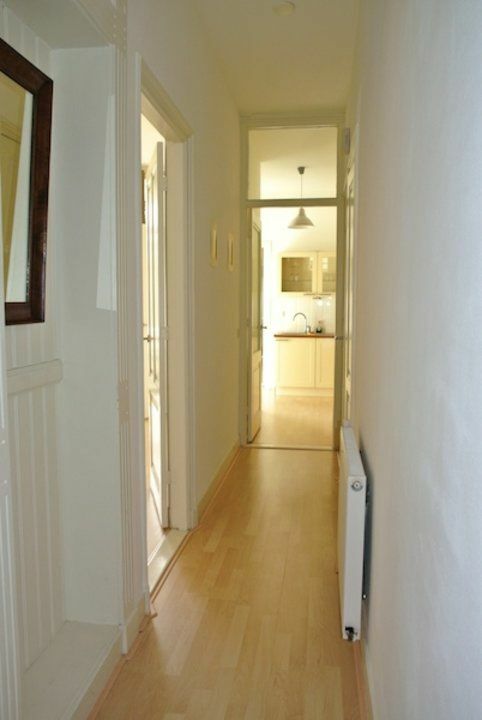 Entrance hall, toilet and access to the bright and cozy living room with classic en-suite sliding doors. From the living room doors to the balcony facing south-east. In the rear building a nice kitchen with appliances. Spacious bedroom with connected the bathroom with shower and sink. Behind the bedroom is an extra room located which can be used as a dressing room or study. This sharp price is based on a minimum contract period of one year! Shorter rental periods, but not less than 6 months, it is also possible, but for a higher price.